According to an article in the Atlanta Journal Constitution, free agent right-hander John Smoltz is now throwing which puts him ahead of schedule in his rehab. 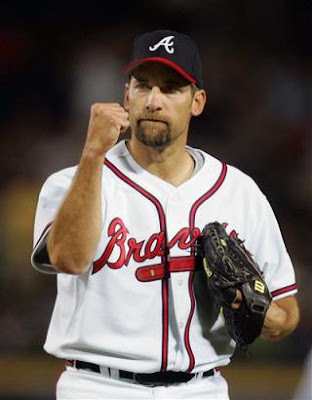 I admit to having an irrational love for John Smoltz. He will always be one of my favorites --even when drafting him is extremely risky. Smoltz, citing a desire to focus his energy on a rehabilitation and workout regimen, has declined most media requests for offseason progress reports. However, he eased the moratorium long enough to confirm that Friday’s session went well, and concurred with Cox’s optimistic view of his comeback. Smoltz and left-hander Tom Glavine are fortysomething free agents trying to rebound from surgeries (Glavine, elbow and shoulder). Braves general manager Frank Wren said he can’t count on either to make it back in 2009, but hopes to offer both of them contracts if and when they get to the point in their throwing programs where it seems like they would be ready to pitch. Glavine was encouraged by long-toss sessions Wednesday and Friday, the 305-game winner’s first times throwing since Aug. 21 procedures to repair a torn flexor tendon and clean out his shoulder. He’s also ahead of schedule in his throwing program, but not yet far enough for such optimism as Smoltz provided Friday. Smoltz, the only pitcher with 200 wins and 150 saves, would likely be elected to the Hall of Fame if he never pitched another inning.